Day one of the Living Below the Line Challenge has come and gone. I wanted to take a few minutes to share my day--and a few realizations with my readers. When I agreed to participate in this challenge--I wasn't out to prove that I could live on rice for a week (I did that in college.) I was in the challenge to raise poverty awareness--both in myself and others. Breakfast. 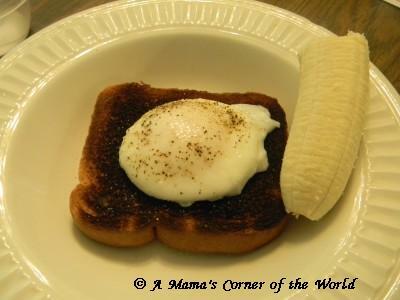 I decided that, for today, I would poach one egg in water and season it with salt and pepper and eat with one slice of toasted bread and 1/2 a banana. Not a bad breakfast. (It's really what I typically have most days--although adding 2-5 cups of coffee is my norm.) As I was poaching the egg and toasting my bread--the phone rang with a telemarketer. In the 20 seconds that I was attached to the wall (yes, we have a corded telephone in our kitchen!) --the egg boiled over, drowning the gas flame and the toaster lever jammed causing my one slice of toast to burn. I started to toss the charred toast to the dog--when I remembered that that charred toast is one of six slices of bread in my weekly budget. If I tossed it--I would be taking food away from later in the week. What if something happened to the rest of my bread? I couldn't afford to toss away that burnt toast. Hmmm. Realizations. I don't have the option to eat what I want or what I like--I really need to eat what I have. Lunch. Rice with sauteed carrots and onions. Again--this isn't so different than my usual lunch fare. I typically have a protein source--and my rice is generally healthier brown rice instead of sticky white rice--but, rice and vegetables are acceptable. I hit a minor speed bump as I peeled my onion to portion it up and chop some into my teaspoon of oil: 1/3 of the onion was marked by a black spot. Hmmm. My usual response would be to toss the entire onion and hope for something better in my onion basket. Not today. I have two onions--for the entire week. I salvaged what I could from the other half of the onion and hoped that it didn't make me sick after it was cooked. Dinner. 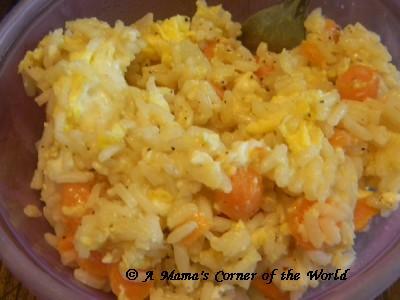 Since I prepared enough rice, carrots and onions to split for my dinner meal at lunchtime--there would hopefully be no food mishaps. When I went to retrieve my dinner--I was hit with an attack of panic. It was missing from its spot on the shelf. Had my oldest daughter eaten it before going to work? NOW WHAT WAS I GOING TO DO??? Then, three minutes later, I found it--she had put it into the meat and cheese drawer. Knowing that I needed a bit of protein--I added an egg to some cooking oil and essentially fried it with the rice to warm it. It wasn't so bad. 1. Food preferences are gone for those in poverty. Living trumps liking. 2. Food choices must be made extremely carefully. Not only the food budget must be balanced--but, nutrition must be achieved as best as possible. 3. Fresh foods should be inspected carefully before purchase. What if my entire onion had been spoiled? Losing 1/3 of it was bad enough! When every penny counts, care must be taken in purchasing. 4. My family is extremely spoiled. There is a cupboard and two spice racks full of herbs and spices to make our food taste better. 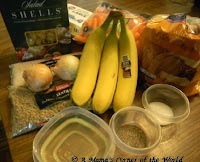 We have a pantry and a shelving unit holding a variety of staples and supplies to add flavor and variation to our meals. 5. Healthy choices disappeared when I entered the grocery store with $7.50 for the week. Forget whole grains. Forget most fresh produce and lowfat dairy options. If you are interested in donating or learning more about the Living Below the Line Challenge--visit the Below the Line website. I raised 4 children alone - no welfare, no child support, my ex husband nowhere to be found. - I always tell people we didn't eat steak but we had burger, a cow is a cow, right? And my kids didn't have brand name but they had brand new. I was fortunate that I only had to work one job.. Fruits and vegetables were always my greatest challenge. Unfortunately the most unhealthy food choices are also the cheapest.. It's really sad, but true. Just look at McDonald's. Where else can a family of four eat for $10-$12? So high in fat, and probably next to no nutritional value, yet, it is all some can afford. Mac & cheese, the generic kind, was 10 for $10 when I was a kid, and we ate a lot of it. Fresh fruit was a special treat. I'm so grateful I can afford to feed my kids healthy food, and sponsor 4 kids through World Vision. Thanks for a great post.